"Advanced Satellite Systems for Post 2010 Aircraft Traffic Control and Monitoring Capabilities: Design and Spectrum Challenges" by Dr. Joseph N. Pelton, Director, Space & Adv. Communications Research Institute, George Washington Univ. and Executive Director, Arthur C. Clarke Institute for Telecommunications and Information. "It is now possible to design and implement new broadband satellite telecommunications and space navigation systems that could greatly enhance air safety, airline security and air traffic management and control. Such a new system would be very challenging in that it implies significant new broadband mobile satellite communications capabilities in terms of throughput, reliability, beam interconnection, processing and switching and two-way and multi-point interconnection with an ever increasing fleet of aircraft. Such a system might indeed require new frequency allocations for this purpose. The first critical step that is needed is to conduct an in-depth feasibility study that would scope out the expanded range of information needed to implement such an expanded and modernized system"
Ms. Hiroko Aoki, Fujitsu Advanced Solutions Ltd.
"My work is related with the ground system of a satellite, and the orbital dynamics system, which treats the orbital determination and orbit control of a satellite also in it." It seems that the positioning and timing data is getting more and more important in next decade. The satellite positioning technology is comprehensive from space vehicles to ground user receivers. In order to maintain Japanese position in the world GPS application market, I believe we have to continue R&D of satellite positioning system, especially space segment. Annual SATELLITE 2004 Conference was held at the New Convention Center in Washington D. C. from March2 to 5, 2004. I had the opportunity to attend the Conference representing AIAA-JFSC. PTC (Pacific Telecommunications Counsel) was held at Hilton Hawaiian Village in Honolulu Hawaii in January 10-14 2004. Host in this year were France Telecom, Macquarie Corporate, Quest Communications International Inc, Sony Corporation, The Satellite Industry Association, SK Telecom, Telstar International Inc., Telus, Verizon Global Solutions, Inc. Main theme in this year of PTC2004 is "Global Broadband/Global Challenge"
We can release February/March issue. Although we have decided to upload on time, even March has passed half. 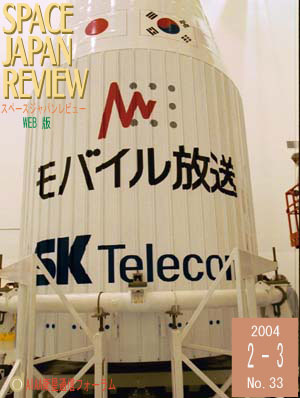 Satellite Digital Broadcasting is main topics in this issue and we are waiting for the article from MBCO. Fortunately their satellite has been launched successfully yesterday and they can prepare a wonderful article for us. In Space Japan Club, Mr. Kogure, JAXA Japan, has been responded to our request without any means. I would appreciate the support to AIAA Satellite Communication Forum in succession.